"Impact of Ascending Signs : Libra"
Libra is an airy sign ruled by Venus, the significator for materialistic pursuits and comforts. Saturn, the planet of hard work and discipline, is exalted in this sign and the Sun, the significator of vitality and status, is debilitated. If the Sun which rules the soul is involved in this sign which rules luxuries and pleasures, the spiritual development of the person is obstructed and that is why the Sun gets debilitated in this sign. If Saturn is placed in this sign it gets exalted because Saturn ruling servants occupies the sign of luxuries and pleasures. These factors render the Librans a magnetic personality, if Venus is strong. The person makes use of the body language for communicating with others. If Libra rises as the ascendant, the Ishta Devata would be mother divine, Goddess Lakshmi. This sign rules lumbar region and lumbar bones, skin, lower part of large intestine, bladder and inner sexual organs such as ovaries, uterus, testicles and prostate gland. If Venus is strong, the Librans enjoy good health. Otherwise, they are vulnerable to diseases connected with parts ruled by this sign, skin diseases, diabetes, venereal diseases, renal problems, urination problems, arthritis, etc. This is the mooltrikona sign of Venus. Libra is a moveable, positive, rajasic, tri-dosha, male, talkative, semi-fruitful and biped sign and signifies sense of justice, clarity, strong will-power, optimism and is highly sensitive. Its talkative characteristic provides the person capacity to communicate, including the use of body language and facial expressions for making the communication more effective. Its positive characteristic makes the person a contributor instead of being only a consumer. Its airy characteristic makes the person a thinker. Its semi-fruitful characteristic blesses the native with affluence and resourcefulness in life. Depending on the influences on the ascendant and/or Venus, the sign Libra usually gives their natives a strong sense of harmony, justice, balance, charm and aesthetic sense, making them spontaneous, artistic, charismatic, harmonizing, humanitarian, independent, adaptable, idealistic, talkative, thinker and able to consider different aspects of standpoint and judgment or offensive arguments, inconstant, changeable and indecisive. They can attune themselves to the love of truth and thereby quickly learn to transcend the world. Apart from Rahu and Ketu, Mercury also becomes a functional malefic planet for this ascendant. Venus, Jupiter, Saturn, Mars, the Moon and the Sun are functional benefic planets for Librans. Natal Mars in the first, second, fourth, seventh, eighth or twelfth house does not make them Manglik. Saturn's transit is not inauspicious in any of the benefic houses as Saturn is a yogakaraka planet for the Libra ascendant. Rather, whenever transit/natal Saturn forms close conjunction/aspect with any strong natal/transit functional benefic planet or most effective point of a benefic house, it triggers a happy incident/event signified by the house of such a conjunction/aspect, the functional benefic planet involved and its respective mooltrikona house. The so called Budhaditya Yoga i.e. combination of the Sun and Mercury signifying extra-ordinary intelligence, does not show positive results for the native. A Libra with deep combust Mercury means that the Sun forms close conjunction with the functional malefic planet, Mercury, and gets afflicted. Such natives have weak digestion, are not sharp and are impulsive. The sign Libra signifies sense of justice, clarity, strong will power, optimism and is highly sensitive. Libras are intelligent, restless and good natured and have a pleasant disposition. They want to win others with love and hate violence. They have keen interest in performing and fine arts. The weakness and affliction to Venus can turn them into depressed, stubborn, argumentative and annoying persons. Librans are cautious, confident, interested in learning, gentle, artistic, and capable of getting out of difficult situations. Libra is a comparatively fortunate sign to be born in. The lord of the sign is an affluent planet and is significator for enjoyments and comforts. It gives advisory roles in the fields of finance and law, makes the person a life savior through the practice of medicine and gives tremendous growth in business activities. The reason is that, apart from Rahu and Ketu, Mercury is the only planet that acts as a functional malefic planet for Librans. As Mercury is a fast moving planet, obstructions caused by its transit over natal positions are short lived. A strong Venus blesses all good things mentioned herein before. Endeavors of Librans are signified by Jupiter as per its strength in the nativity. A strong Jupiter blesses them with good initiative, entrepreneurial nature, courage, the power of understanding and communication, valour, younger brothers and a sound breathing system. A strong Saturn, being yogkaraka planet for this nativity, makes the person worldly wise and shrewd. The life and business partners of Librans are highly active as they are signified by Mars. A strong Mars blesses Librans with good spouse and sound partners in business, vitality, comforts and good life in foreign lands. They easily conduct their professional affairs as their tenth house is ruled by the Moon. A strong Moon blesses Librans with comforts, professional happiness and fame. The eleventh house, signifying income, elder brothers, friends and desires, is ruled by the royal planet, the Sun. They think big and enjoy successes of a high order. They enjoy the patronage of highly placed friends, elder brothers and governmental authorities, whenever the Sun is strong in the nativity. This is the reason why big industrialists are always friendly with top political bosses. Strong Mercury assures a disease-free and happy married life for Librans. Although the scenario is dependent upon the overall configurations of the chart and operating major periods of planets, the strength of individual planets does signify trends in life to a large extent. In the case of matters signified by houses containing non-mooltrikona signs of planets, suffering and/or tragic happenings only take place if one or several of the functional malefic planets, Mercury, Rahu and/or Ketu, exert their close influence on the most effective points of the said houses, and the significators of these houses are weak. Further peculiarities of these natives are discussed in the case studies for better understanding. An exalted and strong Sun blesses Librans with government authority, residences abroad and financial gains in foreign lands besides a happy marital relationship. An exalted and otherwise “strong” Moon blesses them with good professional ventures with some obstructions. An exalted and strong Mars ruling executive authority blesses them with good status and settlement in foreign lands. Exalted, strong and unafflicting Mercury blesses them with peace in marital relationships, comforts and sharp intellect. An exalted and strong Jupiter blesses them with good communicative power, success in marketing, young brothers and successful business ventures. An exalted and otherwise “strong” Venus blesses them with good health and financial position with some challenges and anxieties in life. An exalted and strong Saturn blesses them with sharp intellect, happiness through children, creativity, comforts and gains through comparatively safe speculative investments. Similarly, are to be read the results of the planets when they are in their signs of debilitation causing deterioration in the aspects signified by the weak planets. However, the significations likely to be promoted when the planets are exalted get a setback when the concerned planets are weak. Close conjunction/aspect of functional malefic planet, Mercury, with weak natal positions generates losses and expenses connected with those weak and afflicted natal positions. The close conjunction/aspect of Mercury and Ketu makes one vulnerable to diseases of lungs and paralysis. The close conjunction of Mercury to Venus makes one vulnerable to vices, addiction and prone to sudden infections. The close conjunction/aspect of Mercury to Jupiter makes one vulnerable to disorders of liver and breathing/respiratory system besides causing losses in one’s business ventures. The close conjunction/aspect of Mercury to Saturn makes one vulnerable to addiction, loitering, arthritis and progeny problems. The close conjunction/aspect of Mercury to Mars causes problems in marital life and infectious diseases. The close conjunction of Mercury to the Sun causes loss of income and setbacks to elder brother. The close conjunction/aspect of Mercury to the Moon causes setbacks in professional matters and joint pains. Yellow, all shades of blue, red, pink, orange, golden, white, silver and variegated colors. Green, smoke grey, steel grey, dull brown and faded colors. Diamond, yellow sapphire, blue sapphire, red coral, pearl and ruby. Emerald, gomedh and cat's eye. SUN Deficient income, weak heart and discontentment, trouble to father. MOON Changing professional activities time and again, loss of mental peace, trouble to mother and wife. JUPITER Lack of happiness from male progeny and younger brothers, less enterprising and lack of fame. Lack of communicative power. SATURN Difficulties in academic and professional career, lack of mental peace and intelligence, spinal problems. Depending upon the strength of the Moon, the Sun and Venus, Librans become actors, actresses, financial advisors, hoteliers, legal advisors, managers, musicians, physicians, etc. They like public professions. The influence of other planets on the tenth, first or second houses changes the professional pursuits. Male born 12th April 1946 2030 Hrs. 67E00 24N53 TZ 5.30 Hrs. The ascendant is closely aspected by its lord, Venus, which gave the native a handsome physical structure and pleasant disposition. At the time of birth, the native was running the main period of Venus which lasted till the seventeenth year of age. The yogakaraka, Saturn, is fairly strong and well-placed in the ninth house. This gave him good school education, which enabled the native to go in for medical profession, as practice of life-saving drugs is one of the professions ruled by the planet Venus. Jupiter is badly placed, is in the state of old-age, has a weak dispositor and is exactly afflicted by Rahu from the eighth house. Mars is debilitated in rasi and navamsa is in the state of infancy and its dispositor is weak. The Sun is weak as it is badly placed, in the state of old-age and exactly aspected by Ketu. Mercury is weak as it is badly placed and debilitated. The weakness of Mars has given weak health to wife who is diabetic. The weakness of the Sun has resulted in the loss of highly placed friends. The weakness of Jupiter has denied the happiness of younger brothers and brought in many unsuccessful ventures in life. The native has many friends because of his magnetic personality. Mars, because of its weakness, is not in a position to bestow any benefits in professional matters. Male born 1st December, 1966, 0523 hours 77E13 28N39 TZ 5.30 hours. The sign Libra rises in the ascendant, whose lord is weak as it is combust and has the most effective point of its mooltrikona house under the multiple afflictions of the most malefic planet, Mercury, and the Rahu-Ketu axis. The weak Venus is placed in the second house. The boy is handsome and makes use of his facial expressions in conversation. The close influence of all the functional malefic planets on the lagna gave the boy the habit of intoxication very early in life and the disease of fits, in the Rahu's sub-period in the main period of Jupiter. The yogakaraka planet, Saturn, is weak as it is in old-age. Both the Sun and the Moon are strong, giving birth to the child in an affluent family with long living parents. The placement of the tenth lord, the Moon, close to the most effective point of the ninth house, has given rise to the business of export of articles governed by the Moon. The placement of strong Jupiter in the tenth house has given tremendous initiative concerning business at a young age. Jupiter is strong and occupies tenth house in exaltation. The placement of the lord of the seventh house in the twelfth house delays the celebration of marriage and gives living in foreign lands or distant places from one’s native place. During the sub-period of Mercury in the main period of Saturn, the boy was almost a drunkard. The health was badly affected. The Sun in the second house is aspected by another functional benefic planet, exalted Jupiter, closely. This gave a high status to father, elder sister and promises affluent income to the native. Owing to potentialities in the chart in favorable periods, the bad habits of the native could be controlled. With the astral remedial measures, health also improved remarkably in the sub-period of the Moon in the main period of Saturn. The functional malefic planet, Mercury, is close to the most effective point of the seventh house and afflicts both the seventh and first houses. The functional benefic planets, the Sun and Saturn, though weak and afflicted create an auspicious combination to some extent, which influences the most effective point of the ascendant. The Moon is weak as it is badly placed, in the state of infancy and has a weak dispositor. Jupiter is weak as it is combust, badly placed, in the state of infancy and debilitated in navamsa. Mars is weak due to infancy and weak dispositor. The afflictions to the lord of the ascendant and the ascendant have reduced the attractiveness of the personality to a great extent, but traits of Venus, that is, pleasant disposition and etiquettes have helped the native to achieve a tolerably good financial and social status. Rahu and Ketu do not form close conjunctions. 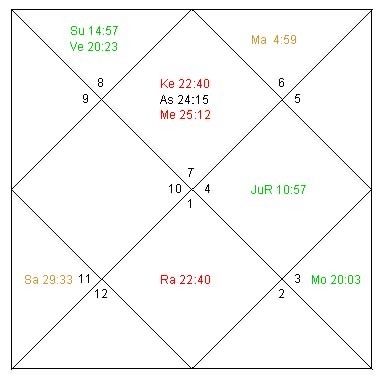 The native is troubled for a period of about six months, almost every three years, when Rahu and Ketu form transit conjunctions/aspects with weak natal planets in the seventh house. The malefic Rahu closely aspects and afflicts the weak Sun in the chart. The strong lord of the ascendant in close conjunction with another functional benefic planet, Mars, is placed in the tenth house. The functional benefic planet strong Moon is exactly conjunct with the most effective point of the fourth house and influences both the tenth and fourth houses. Jupiter is weak as it is badly placed, in the state of infancy, debilitated in navamsa and has a weak dispositor. The functional benefic planet Saturn is strong and closely conjunct with the most effective point of the second house. The native is a beautiful multi-millionaire blessed with affluent, long living parents, happy marital life and three sons. The weakness of Jupiter has not made the native dynamic and enterprising, and she is leading a passive life. Well-placed Moon and Venus make the native generous, wealthy, kind and royal in nature. Birth 16th July, 1948, 1230 Hrs. Patna, India. Jupiter is weak as it is in old-age but it is placed in the house of status ruling the house of communications. The functional malefic planet, Mercury, is closely conjunct with the most effective point of the ninth house and afflicts both the ninth and third houses. The tenth lord, though debilitated and weak, is near the most effective point of the house of status. The Sun and Saturn are weak as they are in infancy and old-age respectively and their dispositor is weak, but they are placed in the tenth house. The influence of functional benefic planets on the house of status collectively made contribution to the native’s career. The native had many highly placed friends/acquaintances, and with the help and assistance of these friends/acquaintances, and connections, the native could become the proprietor and editor of a monthly magazine, giving rise to handsome earnings in the main period of Venus. The weak position of Mars gave health problems to both the native and his spouse. The charm of personality increased during the main period of Venus and the native could be seen often in the company of highly placed ruling politicians of the country in the capacity of a journalist. Male born 9th July, 1986, 1330 Hrs. New Delhi, India. The ascendant and the lord of the ascendant, Venus, are under the close aspect of Rahu. Whenever this type of situation prevails and the lord of the ascendant is weak, the proper development of the child is retarded giving rise to undiagnosed and incurable diseases manifesting in variety of ways. This boy is suffering from excessive corpulence, as the infant lord of the ascendant, Venus, is under the close aspect of Rahu. The lord of the house of development, Jupiter, is weak due to its being in old-age and makes one vulnerable to diseases of the breathing system. Disproportional growth of the physique retards normal mental growth, as well. Saturn's position in the second house, strong and exalted in navamsa in this case, and the strong Moon have, however, not allowed the retardation of the mental functions. During the sub-period of Jupiter in the main period of Mercury, the native started suffering from the breathing disorders. The medical diagnostic facilities in the top institutions of the country have not been able to diagnose the causes of excessive corpulence and breathing disorders. The child has not responded to variety of treatments applied. The operating main period since birth was that of the functional malefic planet, Mercury. This was followed by the main period of Ketu, which is badly afflicting the ascendant by conjunction and fifth, seventh and ninth houses by aspect. 1. Render service to parents/parents in law and old and needy persons. 3. Wear a Kavach (protecting disc of mystical numbers) prepared on a silver/gold disc as per design below in a black color thread/gold chain with numbers to be engraved at an auspicious time.